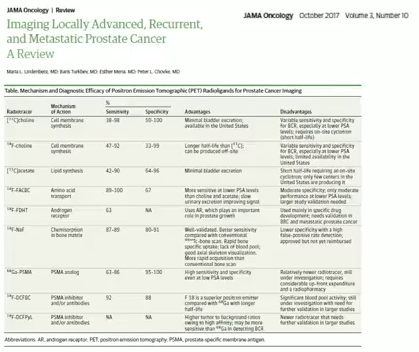 Richard G. Stock, MD, discusses advanced imaging for local, nodal, and distant recurrent prostate cancer, emphasizing positron emission tomography (PET) imaging. He specifically describes the mechanisms of action and advantages of the 18F-FACBC (fluciclovine) radiotracer for PET imaging. Dr. Stock defines patterns of failure as recurrent disease after treatment, categorized into local, nodal, and distant. “Local” refers to recurrence in the prostate bed following prostatectomy or recurrent prostate disease after radiation therapy, brachytherapy, cryotherapy, or targeted focal therapy. “Nodal” refers to non-metastatic pelvic node recurrences, as well as para-caval/aortic recurrences. Lastly, “distant” refers to bone and visceral organ metastases. Traditional imaging techniques, including bone scan, computed tomography (CT) scan, and multiparametric MRI (mpMRI), are advantageous for initial staging and evaluating a patient. Regarding bone scan, sodium fluoride PET/CT scans are especially sensitive for detecting metastases in the bone. CT scan is effective for detecting nodal metastases and changes in the prostate or prostate bed. Finally, mpMRI is primarily useful for de novo disease staging. While traditional imaging is effective in early prostate cancer diagnosis, newer imaging can more accurately detect patterns of failure and recurrent disease. 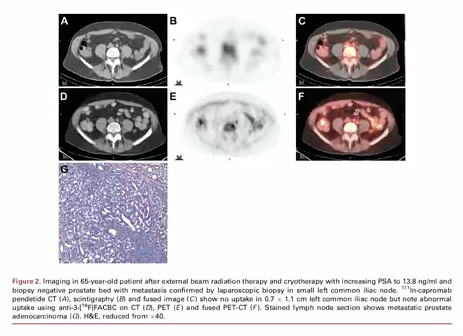 For example, In-111 capromab pendetide (Prostascint) single photon emission computed tomography (SPECT) shows promise in identifying recurrences in the prostate bed after prostatectomy. However, for the majority of this lecture, Dr. Stone focuses on PET imaging. Dr. Stone briefly summarizes the mechanisms of action, advantages, and disadvantages of [11C]choline, [18F]choline, [11C]acetate, and 18F-FACBC (fluciclovine) for prostate cancer imaging. The chart below, from an article in JAMA Oncology, compares these and five additional PET radioligands. Furthermore, Dr. Stone presents evidence to support that fluciclovine is the superior agent for imaging recurrent disease. As an illustration, the figure below compares In-capromab pendetide imaging (images A, B, and C) against fluciclovine imaging (images D, E, and F). Fluciclovine showed uptake in a lymph node metastasis, while In-capromab pendetide did not. Dr. Richard Stock has dedicated his career to delivering the highest quality care to patients using the most advanced technology available, including intensity modulated radiation therapy (IMRT), Novalis shaped beam radiosurgery, real-time ultrasound guided prostate seed implants and Mammosite, all of which allows for meticulously targeting the tumor while achieving maximal sparing of normal tissues. Dr. Stock has served on the board of American College of Radiology Testing and the American Brachytherapy Society, where he is member at large, and as guest editor of a special Brachytherapy issue of Techniques in Urology. He has lectured and presented at dozens of meetings and symposiums across the country and internationally, including New York, San Francisco, Chicago, Philadelphia, Boston, Spain, Holland, France and Japan. Dr. Stock completed his internship at Beth Israel Medical Center and his specialty training at Memorial Sloan-Kettering Cancer Center. He is listed in America's Top Doctors.